For all of our determination and intelligence there is a dark, nonsensical element of the Source that eludes our comprehension and thereby leads us to a thin vertical path through the pine trees. We remembered, while reading, that there had once been works which had not tried to prove anything, content to stand on their own merits, not presuming to each of their patron’s bread, saying this would wake me—the noise of some guns, smoke ascending to heaven. In these circumstances, the Source confines itself to a string of paradoxes and takes refuge behind a barrage of high-sounding words. A better sense of values and the passage of time make it possible today to correct this. Laws were not designed to prevent dishonorable practices, so ostracism is the ultimate remedy for intentional offenses. I am sorry you should have the trouble of carrying your little notebook so far. 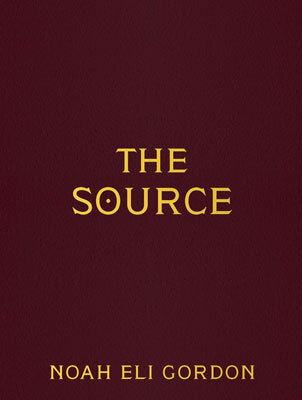 From January of 2008 to September of 2009, I read only page 26 of nearly ten thousand books at the Denver Public Library, culling from them bits of language, which I then fused together, altering some nouns to read ‘the Source’ so they became reflective of the parameters of the project. At its core, the book is a prose cento, a continuation of a practice dating from the Homeric song stitchers of antiquity to current trends in hip-hop culture and electronic music; however, it’s also a testament to the interconnectedness and mutability of all writing, as well as an exploration of the notion of origins, both textual and spiritual. The choice of page 26, while obviously corresponding to the amount of letters present in the English alphabet, is also important in Kabbalist terms; it represents the numerical value of the Tetragrammaton, the four Hebrew letters that form the name of God. Additionally, according to the Talmud, the Torah would have been revealed during the 26th generation of the history of the world; thus, it is Moses who, 26 generations after Adam, receives the Torah transmitted by God. Interestingly, by using a correspondence table, where each letter is giving in ascending order a numerical value (A=1, B=2, C=3, etc. ), the name of God in English has a total value (G=7, O=15, D=4) of 26. The problems of numerology aside, I undertook this project in order to investigate whether or not constraint-based, conceptual writing might have a spiritual dimension. It is now my belief that rigid and systematic modes of writing can embody an emotionally charged engagement with the world. The project also underlined the versatility of language itself, showing that despite any set of constraints upon it, despite censorship, for example, language can always find a way to prevail against these obstacles. Language really is a living thing with a robust vitality. Language is like a weed that cannot only endure but also thrive under all kinds of difficult conditions. This robustness of language has encouraged me to try even more ambitious projects that might push language to its limits. Gordon has long worked in the book-length form, collecting prose-poem fragments into long and longer structures, from his Acoustic Experience (Pavement Saw Press, 2008), Figures for a Darkroom Voice (with Joshua Marie Wilkinson; Tarpaulin Sky Press, 2007), A Fiddle Pulled from the Throat of a Sparrow (Western Michigan University, 2007), Novel Pictoral Noise (Harper Perennial, 2007), Inbox (BlazeVOX, 2006), The Area of Sound Called the Subtone (Ahsahta Press, 2004) and The Frequencies (Tougher Disguises, 2003), as well as a number of chapbooks, so he certainly has the chops for a project of such depth. 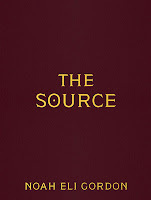 The Source is a fascinating and entertaining read, but his project feels as though Gordon is working more to prove something to himself as a writer and reader than to the rest of us, some who might already have come to similar conclusions some time ago. But perhaps this is exactly what writing should be, what literature is meant to do, explore and re-explore ideas from different angles, and working through whatever ideas may develop. For some time now, Noah Eli Gordon has struck me as a writer worth watching, in part, because you don’t always know what he is going to be doing next, and this collection is certainly more than worth watching. It makes me even further intrigued about just what might follow. The story is essentially the same: if you are intent on your climb and would never consider cutting back, then balance the sphere of ordinary understanding not in any mere figure of speech, still bent over the shoes you’re mending, but in actual fact loosened from its anchorage to the body. The most decisive adherence to the Source is a mere mechanical routine of carrying out abstract rules, a school bus painted with drab colors, tumbling as a fertility rite, the elevator door silently opening. The Capilano Review 3.13: Manifestos Now!